HomeDBBIA EventTrick or Treating extravaganza hits Downtown Brampton Saturday, October 28! 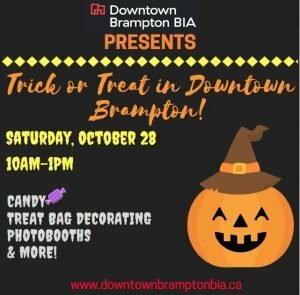 Trick or Treating extravaganza hits Downtown Brampton Saturday, October 28! Brampton, Oct. 24, 2017 – On Saturday, October 28, downtown Brampton will be in the Halloween spirit with a number of events kicking off in the downtown core. The Downtown Brampton BIA (Business Improvement Area) is pleased to host Trick or Treating in downtown Brampton on Saturday, October 28. This event welcomes families to downtown Brampton for a community event supported by local businesses. The event runs from 10 a.m. to 1 p.m. and is free to all. Local businesses are encouraged to dress up in costume as they welcome families into their shops. With over 30 participants, this event is surely going to satisfy everyone’s sweet tooth. The festivities will begin in Vivian Lane (70 Main Street North) with a treat bag decorating station being run by the Brampton Rangers and the Downtown Brampton BIA. The BIA will be distributing maps with participating businesses to guide families on their treat route. Vivian Lane will also be host to PhotoboothTO’s party prop booth that will be providing families with a free photo printout memory of the event! You can also find the newly launched Downtown Brampton Harvest Market happening during all these events from 8 a.m. to 1 p.m.
A not-for-profit organization established to support and strengthen the local business community and help promote Downtown Brampton as a shopping and business district, the BIA represents more than 400 businesses and commercial property owners reporting to a 10-12-member volunteer Board of Directors.